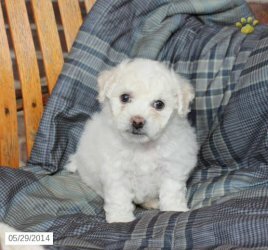 Cute, lovable, and friendly little fluffballs Bichon Puppies, These adorable Bichon puppies are family raised and well socialized with children. These will make great family pets and apartment companions. Up to date with their shots and dewormer. Ready for a loving home, Adorable, lovable, playful, and friendly! These puppies have great personalities and non-shedding coats.